Ciao, I am Giulia Scarpaleggia, a Tuscan born and bred country girl, a home cook, a food writer and a photographer. I teach Tuscan cooking classes in my house in the countryside in between Siena and Florence, where my family has been living since the 1920’s and where I live now with my husband, Tommaso, and our dog, Noa. I’ve been sharing honest, reliable Italian recipes for 10 years now, through my cookbooks and this blog. Why an Italian accent? Well, I’m pretty sure you can hear it when I talk, and you can taste it when I cook. I invite you into our home in the Tuscan countryside, into this busy kitchen and into my well stocked pantry. 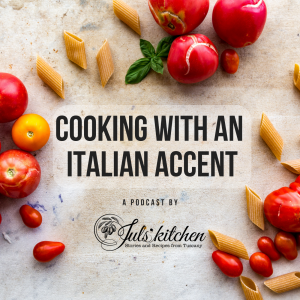 I will also answer listeners’ questions about Italian and Tuscan cooking, about that pack of dried cannellini beans you do not know how to use, about extra virgin olive oil or our love for stale bread. So, if you have a question in your mind, just email me at juls@julskitchen.com or join our Facebook Group Cooking with Juls’ Kitchen. I’ll answer your questions at the end of each episode. Be sure to subscribe on iTunes, Spreaker or wherever you are listening to a podcast. Rate and review the show. It will help us to be found on line and build up an appetite for Italian food. Share with your friends, too!